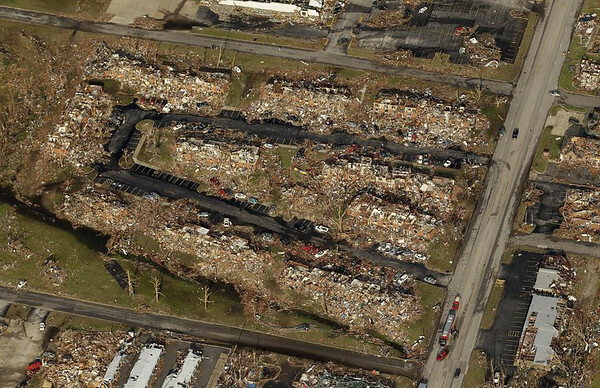 The path of a powerful tornado is seen in Joplin, Mo., Tuesday. A tornado moved through much of the city Sunday, damaging a hospital and hundreds of homes and businesses and killing at least 116 people. Coverage of Sunday’s deadly tornado that swept through southwest Missouri includes first-hand reports from the Joplin Globe, owned by Community Newspapers Holdings, Inc., the Record-Eagle’s parent company. The Record-Eagle will carry stories, photos, columns and other reports from the Joplin Globe at record-eagle.com and in our print and e-Editions. For news direct from Joplin, visit http://www.joplinglobe.com.